Ready Player One paints a rather bleak picture of the near future. After humanity simply gave up on solving most of its problems, they instead turn to the OASIS, a massive virtual world used by almost everyone, all the time, for anything. Teenager Wade Watts spends his time hunting for a hidden easter egg, which grants the finder complete control of the half-trillion-dollar business. He and his friends become the first players to complete the beginning challenge, setting off a series of events that give us our movie. There’s certainly enough sporadic and mindless fun to keep the 140-minute runtime from feeling like a slog, but Ready Player One is the definition of style over substance. There’s no doubt that it’s a serviceable and entertaining ride, but the formulaic plotting and uneven tone keep it from transforming its source material into more than a guilty pleasure. Ready Player One changes a lot from its source material, enough that it feels more like an inspiration than a direct adaptation. The best change made was cutting out a good chunk of the exhausting and oft-maligned pop culture references that became more and more grating as the novel went on. The characters in this adaptation are by no means fleshed out and three dimensional, but they’re mostly serviceable for what the film tries to accomplish. The other noteworthy change is how the three challenges function. The first of these takes the form of a race through a fictionalized city, complete with giant monsters, wrecking balls, ramps, and other hazards. Through this sequence, I began to experience what I believe people refer to as ‘fun and excitement’, though I could be wrong. The ultimate revelation of how this challenge is completed, however, left a lot to be desired. I won’t spoil it, but the idea that not a single person had figured it out in the several years since the contest’s unveiling was immersion-breakingly nonsensical. The other two challenges are a substantial improvement, with the highlight of the film being an extended sequence in which our heroes have to traverse the haunted world of The Shining. Detail is meticulous, and the use of some of the horror classics most memorable moments make this entire segment a standout – and possibly worth the price of admission alone. The near-future dystopia that the characters of Ready Player One escape from in the virtual world is one plagued with poverty, corporate corruption, and an overabundance of seemingly omnipresent drones that do everything from monitoring citizens to delivering Pizza Hut (which is apparently still kicking it in 2045, so good for them). We don’t spend a lot of time in the real world – and that’s a good thing. Despite some impressive production value and set design, the real world isn’t nearly as ripe with opportunity for storytelling as the OASIS is, which the writers were clearly in tune with. In both worlds, we spend the majority of our time with the aforementioned Wade Watts (Tye Sheridan), the protagonist, Samantha Cook (Olivia Cooke), the love interest, and Nolan Sorrento (Ben Mendelsohn) as the head of IOI. the evil organization is attempting to take over control of the OASIS in order to monopolize and corporatize it, seemingly destroying the intent of its creator, James Halladay. 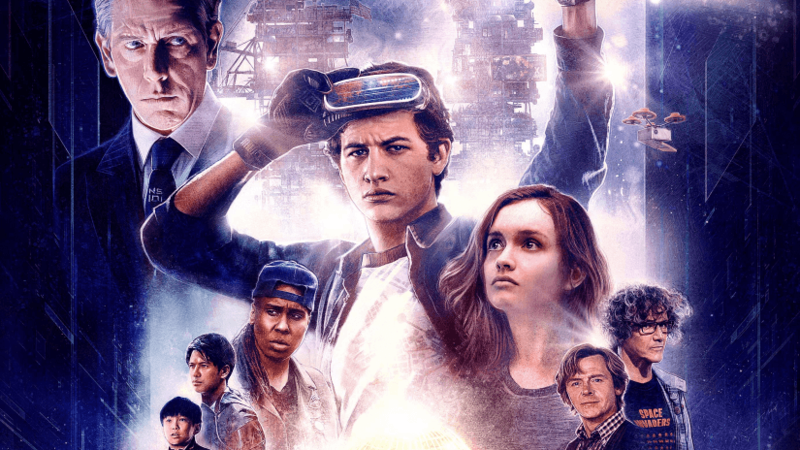 Once again, we come to Ready Player One’s biggest strength and weakness – every character and story arc is so unabashedly formulaic and reminiscent of 80s and 90s classics that it’s hard for this film to feel like its own thing. The last act is where the classic movie moments are in full force; angry villains being pulled away in a cop car, the dramatic kiss between the two protagonists and a brief narration from the main character explaining everyone’s fate. It feels like synthetic Spielberg-ian movie magic, like an inexperienced director trying to emulate this style rather than capture its emotional authenticity. I really can’t be too hard on Ready Player One. Spielberg doesn’t capture the same magic that made his older films such classics, but it remains a largely admirable effort that improves upon its source material, despite never transcending it. If you can look past the lack of real emotional substance, it’s a step above most ‘popcorn’ movies thanks to its strong direction and presentation, with several standout sequences and impressive visuals that make it a serviceable and solid ride.